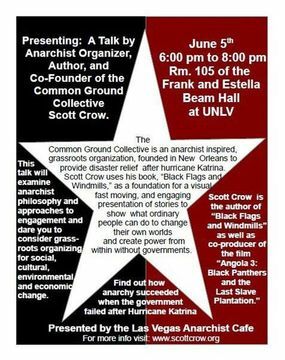 The Las Vegas Anarchist Cafe will be hosting a presentation by Scott Crow, in Las Vegas at UNLV’s Frank and Estella Beam Hall (room 105) on June 5th. The Common Ground Collective is an anarchist inspired grassroots organization founded in New Orleans to provide disaster relief after Hurricane Katrina. 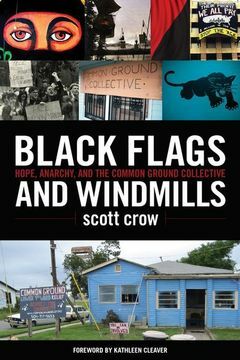 Crow uses his book, “Black Flags and Windmills,” as a foundation for a visual, fast moving, and engaging presentation of stories to show what ordinary people can do to change their own worlds and create power from below without governments. The talk seeks through a collection of stories to show how the philosophy of anarchism has shaped and changed modern political movements. Anarchism’s influence on organization and actions has allowed spaces for projects like the Common Ground Collective, the largest anarchist organization in modern US history to come into existence after Hurricane Katrina, the Occupy uprisings, and the environmental climate change movements across the US. The presentation which is equal parts personal story, radical history and organizing philosophies asks questions about how we engage in social change, the real and perceived challenges presented by the state and dares us to rethink our grassroots movements in how we engage for the future. This talk will be of interest for anyone that has been involved in grassroots organizing and community related planning from a decentralized, member based perspective. Over the last two decades scott has worked for a number of national organizations like Greenpeace, A.C.O.R.N. and Ruckus Society and co-founded a number of varied projects, businesses and organizations including Lesson Seven (political industrial band), Red Square (coop art gallery), Century Modern (antique cooperative), Treasure City Thrift (volunteer/worker cooperative) and the Common Ground Collective in New Orleans after Hurricane Katrina (the largest anarchist inspired organization in modern US history). He is the author of the book Black Flags and Windmills (PM Press 2011), appeared in What Lies Beneath: Katrina, Race and the State of the Nation (South end Press) and co-produced the film Angola 3: Black Panthers and the Last Slave Plantation (PM Press). He has appeared in international media as both a writer and subject including the NY Times, Democracy Now, CNN and NPR as well as the documentaries Welcome to New Orleans, Better this World, and Informant. NPR’s This American Life called him “a living legend among anarchists” and the New York Times characterized him as “anarchist and veteran organizer… that comes across as more amiable than combative…”. Currently Scott splits his time speaking and consulting nationally and organizing locally. The Las Vegas A-Cafe is a weekly meeting of local Anarchists that has served as a social and political discussion group and organizing space for over four years. Some of the various groups affiliated with it include the Sunset Activist Collective, Nevada Cop Block, Food Not Bombs Las Vegas, OccupyLV.org, and the Las Vegas Industrial Workers of the World. Jun 19, 2012: Education/Outreach Committee meeting. This week we will be holding our first Education/Outreach Committee meeting. The main purpose of this meeting will be to continue discussions that have been taking place recently about putting together a zine/pamphlet/flyer that educates the community about what Food Not Bombs Las Vegas does and using that material to connect with other activist groups at UNLV/CSN and the community at large. In addition we will take this opportunity to brainstorm other ideas about how to get more members/groups within the local community involved in the local FNB branch and expand our outreach to other potential members. This meeting will be held at 5pm on Saturday, June 23 at Sunrise Coffee, immediately prior to our weekly organizational meeting, which commences at 6pm at Sunrise Coffee. Sunrise Coffee is located at 3130 East Sunset Road, Las Vegas, NV 89120, between Pecos and Eastern. See you Saturday! Food Not Bombs Las Vegas will hold its weekly picnic at Baker Park between 10:30 am and 12:00 pm on Aug. 13. Bring food if you have it, yourself if you don’t. Food Not Bombs Las Vegas will hold its organizational meeting at The Beat Coffee in Emergency Arts at 2:00 pm on Aug. 13. Bring food if you have it, yourself if you don’t. Food Not Bombs will hold its weekly organizational meeting at The Coffee Bean and Tea Leaf, 4550 S. Maryland Pkwy., this week. Meeting is still at 2 p.m. on July 9. Click here for directions. See you there. Food Not Bombs Las Vegas will hold its weekly picnic at Baker Park between 10:00 am and 12:00 pm on July 10. Bring food if you have it, yourself if you don’t.